I love cucumbers and I love sprouts and I LOVE this combination. 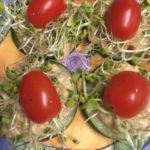 It takes less than 3 minutes to create and clean up…then sit and enjoy these crunchy yummy Cucumber Sprout Bites, vegan goodness! Going Gluten Free often means doing without crunchy snacks, especially if rice crackers don’t float your boat. 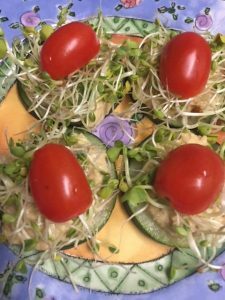 With Cucumber Sprout Bites you get crunchy with enzymes and protein. Sprouts are an incredible powerhouse of nutrition! 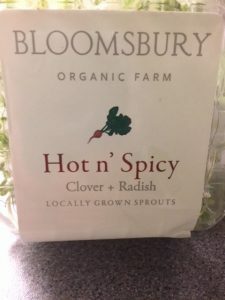 The Cucumber Sprout Bites have approximately 2 Tablespoons of Sprouts, you’ll notice these are Clover and Radish. The entire nutrition the plant will ever hold is found in the sprouts. So when you consider those 2 Tablespoons as full clover and radish plants, you get ALOT of nutrition in a few bites. I love hummus, this one was a spicy jalapeno cilantro hummus; my fav. If you don’t like hummus you could do a guacamole instead…or sometimes I make homeade Kefir Cheese and the herbed version would be good. How about a nut cheese? The possibilities are limitless! WOW! I was shocked too…so the obvious choice if you are on a fat removal program…Cucumber Sprout Bites. This 3 minute snack is crunchy, flavorful and packed with nutrition. Make a mini-plate for yourself or serve as appetizers at an event or potluck. 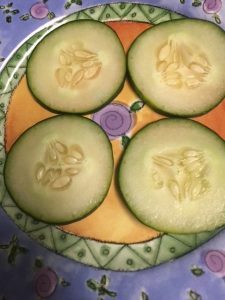 Slice cucumbers in equal sizes. 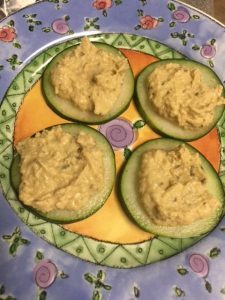 Divide 2 Tablespoons of your favorite sprouts between the cucumber/hummus rounds. 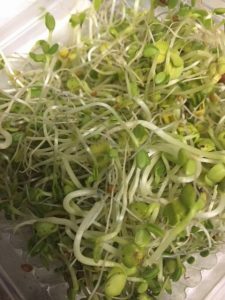 You can grow your own sprouts...it's simple! Or you can purchase them at your local health food grocery store.